Below are references to exhibition catalogues of Monty and Stella's work. Images from actual catalogues are from ones in my possession. Other information is from on-line research and press cuttings. There are still a few inconsistencies indicated by "?". Please let me know, via the 'contact' page of this website, of catalogue information I have missed. The Pennsylvania Academy of Fine Arts. Annual Water Color and Miniature Exhibitions. (14th Annual Exhibition of Miniatures). City Art Museum Saint Louis. An Exhibition of Selected Water Colors and Miniatures by American Artists. The Pennsylvania Academy of Fine Arts. Annual Water Color and Miniature Exhibitions. (15th Annual Exhibition of Miniatures). The New York Watercolor Club; The Art Alliance of America; The Carnegie Institute of Pittsburgh; Los Angeles; San Francisco; and a life size oil portrait of Ann Murdock "on 5th Avenue this winter"
sources: December 1916 Colour Magazine (pages 178-179) and 9 September, The Billboard - "Broadway in Brief"
Source: catalogue? or Evening Sun Article 1918? The Pennsylvania Academy of Fine Arts. Annual Water Color and Miniature Exhibitions. (16th Annual Exhibition of Miniatures). The Pennsylvania Academy of Fine Arts. Annual Water Color and Miniature Exhibitions. (18th Annual Exhibition of Miniatures). The Pennsylvania Academy of Fine Arts. Annual Water Color and Miniature Exhibitions. Maud Allan (purchased for The National Gallery of Victoria, Melbourne by the Felton Bequest Committee). Brooklyn Museum. Exhibition by National Association of Women Painters and Sculptors. London Royal Academy of Fine Arts, Summer Exhibition. Comment: 'Mrs Adam Gimble was previously 'Mrs. Harry Rossbach', painted in 1920. 'Miss Adam Grimble' is 'Mrs Adam Gimble', previously 'Mrs. 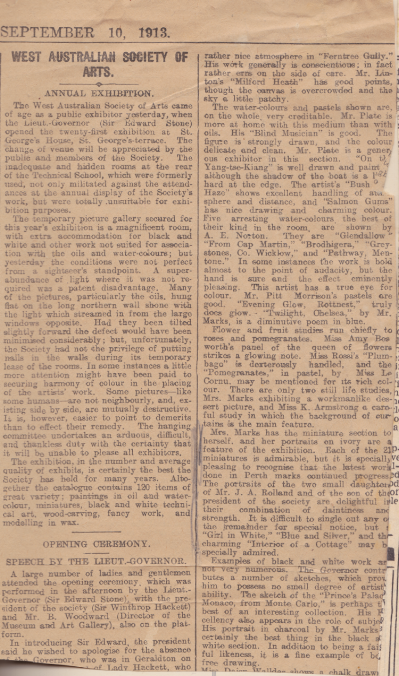 Harry Rossbach', painted in 1920.
sources: National Gallery of New South Wales Catalogue, 22 January 1938 The Argus (Melbourne), Art in Australia Art and Architecture August 1938 (page 19), and letter from Bill Ashton to Stella. London Royal Academy of Fine Arts? source: 1 July 1943 The Scotsman, 1 July 1943 Glasgow Herald, 1 July 1943 Edinburgh Evening News, The Evening Standard. source: Stella's notes on letter from RSM 29 June 1971 - "John's miniature on loan with 3 others"